When Esther Poveda saw an advert for band 5 nurses at Yeovil District Hospital NHS Foundation Trust, she was keen to apply. But she had worked in a care home since coming to the UK from her native Spain 12 months earlier, so she was nervous. Ms Poveda was lucky. Not only did the trust want to recruit a cohort of registered nurses to work on the hospital wards, it was also offering successful applicants the opportunity of a place on its innovative ‘return to work in an acute environment’ (RACE) programme. Associate director of nursing Maddie Groves says the course was designed to help qualified nurses working in care homes or other domiciliary settings to return to work in an acute hospital. 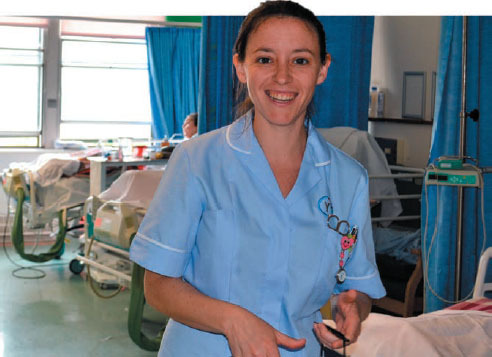 ‘Many nurses who have been working outside the acute setting can lack confidence in returning to work on a ward,’ she says. The course is led by practice educators and Yeovil Academy, the trust’s in-house training facility. By the third week of the four-week course the students’ time is split between classroom and ward, working with a mentor. Ms Groves says the trust received 15 applications for the first RACE intake in March this year, and offered places to 11 students after interview. As one of the first cohort of RACE students, Ms Poveda is currently completing her practice-based competencies on the hospital’s respiratory ward. Academic and clinical skills training. End of life and bereavement care. She says: ‘The course helped me to feel confident about my ability to do the job. Respiratory ward senior sister Andrea Chell says: ‘When Esther came to us she was knowledgeable and confident and knew what to expect. That meant she was able to do the job immediately, which was great. Practice educator Sarah Harvey says: ‘It’s been great to bring the students’ expertise into the ward environment’.